A Mandala (Sanskrit maṇḍala मंडलः "circle," "completion") refers to sacred geometric device commonly used in the religious practice of Hinduism and Tibetan Buddhism, which serves several religious purposes including establishing a sacred space and as an aid to meditation and trance induction, focusing attention of aspirants and adepts, an abode of a Buddha or bodhisattva, a symbolic map of the universe and pathway to liberation. Mandala has become a generic term for any plan, chart or geometric pattern that represents the cosmos metaphysically or symbolically, a microcosm of the Universe from the human perspective. Its symbolic nature can help one "to access progressively deeper levels of the unconscious, ultimately assisting the meditator to experience a mystical sense of oneness with the ultimate unity from which the cosmos in all its manifold forms arises." The psychoanalyst Carl Jung saw the mandala as "a representation of the unconscious self," and believed his paintings of mandalas enabled him to identify emotional disorders and work towards wholeness in personality. Mandals are particularly important in the Tibetan branch of Vajrayana Buddhism, where they are used in Kalachakra initiation ceremonies, and among other things teach impermanence. The Sanskrit word “Mandala “ is a compound deriving from manda, which means "essence," and the suffix la, meaning "container" or "possessor." Consequently, "the etymology of the word "mandala" suggests not just a circle but a 'container of essence.'" A Hindu temple's ground floor plan often takes the form of a mandala symbolizing the universe. The lotus is sacred not only because it transcends the darkness of the water and mud where its roots are, but also because of its perfectly symmetrical petals, which resemble a mandala. Yantra is a Sanskrit word that is derived from the root meaning "to restrain, curb, check". Meanings for the noun derived from this root include "that which restrains or fastens, any prop or support," "a fetter," "any instrument or machine," "an amulet, a mystical or astronomical diagram used as an amulet." Some Hindu esoteric practitioners employ yantra, mantra and other items in their sadhana, puja and yajna. Yantra, or other permutations and cognate phenomena such as Mandala, Rangoli, Kolam, Rangavalli and other sacred geometrical traditions, are endemic throughout Dharmic Traditions. A Yantra can be viewed as an astronomical map or diagram representing the astronomical position of the planets over a given date and time. It is considered auspicious in Hindu mythology. These yantras are made up on various objects i.e. Paper, Precious stones, Metal Plates and alloys. It is believed that if we, as humans, follow the basic principal of constantly concentrating on the representation, it helps you build Fortunes, as planets above have their peculiar Gravity which governs basic emotions and karma, derived to attain satisfaction. These yantras are basically made on a particular date and time depending on the prescribed procedures defined under vedas. Yantra in Sanskrit denotes "loom," "instrument" and "machine." 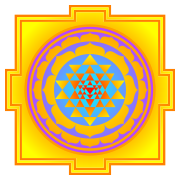 Yantra is an aniconic temenos or tabernacle of deva, asura, genius loci or other archetypal entity. Yantra are theurgical device that engender entelecheia. Yantra are realized by sadhu through darshana and samyama. There are numerous yantra. Shri Yantra is often furnished as an example. Yantra contain geometric items and archetypal shapes and patterns, namely—squares, triangles, circles and floral patterns; but may also include bija mantra and more complex and detailed symbols. Bindu is central, core and instrumental to yantra. Yantra function as revelatory conduits of cosmic truths. Yantra, as instrument and spiritual technology, may be appropriately envisioned as prototypical and esoteric concept mapping machines or conceptual looms. Certain yantra are held to embody the energetic signatures of, for example, the Universe, consciousness, ishta-devata. Some Hindu esoteric practitioners employ yantra, mantra and other items of the saṃdhyā-bhāṣā (Bucknell, et al. ; 1986: ix) in their sadhana, puja and yajna. Though often rendered in two dimensions through art, yantra are conceived and conceptualised by practitioners as multi-dimensional sacred architecture and in this quality are identical with their correlate the mandala. Meditation and trance induction with Yantra are invested in the various lineages of their transmission as instruments that potentiate the accretion and manifestation of siddhi. 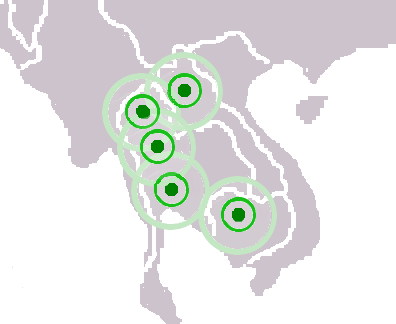 Intersecting mandalas circa 1360: from north to south Lan Xang, Lanna, Sukhothai, Ayutthaya and Angkor. "The map of earlier Southeast Asia which evolved from the prehistoric networks of small settlements and reveals itself in historical records was a patchwork of often overlapping mandalas"
In some ways similar to the feudal system of Europe, states were linked in overlord-tributary relationships. Compared to feudalism however, the system gave greater independence to the subordinate states; it emphasised personal rather than official or territorial relationships; and it was often non-exclusive. Any particular area, therefore, could be subject to several powers or none. The mandala can be found in the Atanatiya Sutta in the Digha Nikaya, part of the Pali Canon. This text is frequently chanted. A kyil khor (Tibetan for mandala) in Vajrayana Buddhism usually depicts a landscape of the Buddha land or the enlightened vision of a Buddha (which are inevitably identified with and represent the nature of experience and the intricacies of both the enlightened and confused mind): "a microcosm representing various divine powers at work in the universe." Such mandalas consist of an outer circular mandala and an inner square (or sometimes circular) mandala with an ornately decorated mandala palace placed at the center. Any part of the inner mandala can be occupied by Buddhist glyphs and symbols  as well as images of its associated deities, which "symbolise different stages in the process of the realisation of the truth." Mandalas are commonly used by tantric Buddhists as an aid to meditation. More specifically, a Buddhist mandala is envisaged as a "sacred space," a Pure Buddha Realm  and also as an abode of fully realised beings or deities. While on the one hand, it is regarded as a place separated and protected from the ever-changing and impure outer world of Samsara,  and is thus seen as a Buddhafield or a place of Nirvana and peace, the view of Vajrayana Buddhism sees the greatest protection from samsara being the power to see samsaric confusion as the "shadow" of purity (which then points towards it). By visualizing purelands, one learns to understand experience itself as pure, and the abode of enlightenment. The protection we need, in this view, is from our own minds, as much as from external sources of confusion. In many tantric mandalas, this aspect of separation and protection from the outer samsaric world is depicted by "the four outer circles: the purifying fire of wisdom, the vajra circle, the circle with the eight tombs, the lotus circle." The ring of vajras forms a connected fence-like arrangement running around the perimeter of the outer mandala circle The mandala is also "a support for the meditating person," something to be repeatedly contemplated, to the point of saturation, such that the image of the mandala becomes fully internalised in even the minutest detail and which can then be summoned and contemplated at will as a clear and vivid visualised image. With every mandala comes what Tucci calls "its associated liturgy… contained in texts known as tantras," instructing practitioners on how the mandala should be drawn, built and visualised and indicating the mantras to be recited during its ritual use. The mandala can be shown to represent in visual form the core essence of the Vajrayana teachings. In the mandala, the outer circle of fire usually symbolises wisdom. The ring of 8 charnel grounds probably represent the Buddhist exhortation to always be mindful of death and impermanence with which samsara is suffused: "such locations were utilized in order to confront and to realize the transient nature of life." Described elsewhere thus: "within a flaming rainbow nimbus and encircled by a black ring of dorjes, the major outer ring depicts the eight great charnel grounds, to emphasize the dangerous nature of human life." Inside these rings lie the walls of the mandala palace itself, specifically a place populated by deities and Buddhas. One well-known type of mandala in Japan is the mandala of the "Five Buddhas," archetypal Buddha forms embodying various aspects of enlightenment, the Buddhas are depicted depending on the school of Buddhism and even the specific purpose of the mandala. A common mandala of this type is that of the Five Wisdom Buddhas (a.k.a. Five Jinas), the Buddhas Vairocana, Aksobhya, Ratnasambhava, Amitabha and Amoghasiddhi. When paired with another mandala depicting the Five Wisdom Kings, this forms the Mandala of the Two Realms. Whereas the above mandala represents the pure surroundings of a Buddha, this mandala represents the Universe. This type of mandala is used for the mandala-offerings, during which one symbolically offers the Universe to the Buddhas or one's teacher for example. Within Vajrayana practice, 100,000 of these mandala offerings (to create merit) can be part of the preliminary practices before a student can begin with actual tantric practices. This mandala is generally structured according to the model of the Universe as taught in a Buddhist classic text the Abhidharmakosha, with Mount Meru at the centre, surrounded by the continents, oceans and mountains, etc. The Japanese branch of Vajrayana Buddhism, Shingon Buddhism, makes frequent use of mandalas in their rituals as well, though the actual mandalas differ. When Shingon's founder, Kukai returned from his training in China, he brought back two mandalas that became central to Shingon ritual: the Mandala of the Womb Realm and the Mandala of the Diamond Realm. These two mandalas are engaged in the abhiseka initiation rituals for new Shingon students. A common feature in this ritual is to blindfold the new initiate and have them throw a flower upon either mandala. Where the flower lands assists in the determination of which tutelary deity the initiate should work with. The mandala in Nichiren Buddhism is called a moji-mandala (文字漫荼羅) and is a hanging paper scroll or wooden tablet whose inscription consists of Chinese characters and medieval-Sanskrit script representing elements of the Buddha's enlightenment, protective Buddhist deities and certain Buddhist concepts. Called the Gohonzon, it was originally inscribed by Nichiren, the founder of this branch of Japanese Buddhism, during the late 13th Century. The Gohonzon is the primary object of veneration in some Nichiren schools and the only one in others, which consider it to be the supreme object of worship as the embodiment of the supreme Dharma and Nichiren's inner enlightenment. The seven characters Nam Myoho Renge Kyo, considered to be the name of the supreme Dharma and the invocation that believers chant, are written down the center of all Nichiren-sect Gohonzons, whose appearance may otherwise vary depending on the particular school and other factors. Like Nichiren, Pure Land Buddhists such as Shinran and his descendent Rennyo sought a way to create objects of reverence, but objects that were readily available to the lower-classes of Japanese society that could not afford the traditional form of mandala. In the case of Shin Buddhism, Shinran designed a mandala using a hanging scroll, and the words of the nembutsu (南無阿彌陀佛) written vertically. Such mandalas are still often used by Pure Land Buddhists in home altars (shrines) called butsudan today. Painton Cowen, who dedicated his life to the study of rose windows, states that mandala-esque forms are prevalent throughout Christianity: celtic cross; rosary; halo; aureole; oculi; Crown of Thorns; rose windows; Rosy Cross'; dromenon. on the floor of Chartres Cathedral. The dromenon represents a journey from the outer world to the inner sacred centre where the Divine is found. Similarly, many of the Illuminations of Hildegard von Bingen can be used as Mandalas, as are many of the images of esoteric Christianity (i.e., Christian Hermeticism, Christian Alchemy & Rosicrucianism). In Islam, sacred art is dominated by geometric shapes in which a segment of the circle, the crescent moon, together with a star, represent the Divine. The entire building of the mosque becomes a mandala as the interior dome of the roof represents the arch of the heavens and turns the worshipper's attention towards Allah. Medicine wheels are stone structures built by the natives of North America for various spiritual and ritual purposes. Medicine wheels were built by laying out stones in a circular pattern that often resembled a wagon wheel lying on its side. The wheels could be large, reaching diameters of 75 feet. Although archeologists are not definite on the intended purpose of each medicine wheel, it is considered that they had ceremonial and astronomical significance. Medicine wheels are still used today in the Native American spirituality, however most of the meaning behind them is not shared amongst non-Native peoples. Dream catchers are also mandalas. Among Indigenous Australians, Bora is the name given both to an initiation ceremony, and to the site Bora Ring on which the initiation is performed. At such a site, young boys are transformed into men via rites of passage. The word Bora was originally from South-East Australia, but is now often used throughout Australia to describe an initiation site or ceremony. The term "bora" is held to be etymologically derived from that of the belt or girdle that encircles initiated men. The appearance of a Bora Ring varies from one culture to another, but it is often associated with stone arrangements, rock engravings, or other art works. Women are generally prohibited from entering a bora. In South East Australia, the Bora is often associated with the creator-spirit Baiame. Bora rings, found in South-East Australia, are circles of foot-hardened earth surrounded by raised embankments. They were generally constructed in pairs (although some sites have three), with a bigger circle about 22 metres in diameter and a smaller one of about 14 metres. The rings are joined by a sacred walkway. Matthews (1897) gives an excellent eye-witness account of a Bora ceremony, and explains the use of the two circles. 2) Vajra-dhatu (Sanskrit: “diamond world”; Japanese kongo-kai), from the many into one." ↑ "Mandals" Crystal Links: Mandalas Retrieved October 4, 2008. ↑ Marty Chappell Handout, how to make a mandala. Retrieved October 4, 2008. ↑ Sacred Art and Geometry: Buddhism Mandalas Religion facts. Retrieved October 4, 2008. ↑ Vaman Shivram Apte. The Practical Sanskrit Dictionary. (Delhi: Motilal Banarsidass Publishers, 1965), 781. For root यन्त्र् (yantr) meaning "to restrain, curb, check"
↑ David Gordon White. The Alchemical Body: Siddha Traditions in Medieval India. (Chicago: The University of Chicago Press, 1996), 481, note 159. For definition: "A yantra (from the root yam) is that which controls or subdues." ↑ For definitions for noun यन्त्रं (yantraṃ) including 1) "that which restrains or fastens, any prop or support"; 2) "a fetter," 4) "any instrument or machine," and 7) "an amulet, a mystical or astronomical diagram used as an amulet"; see: Apte 1965, p. 781. ↑ For definitions for यन्त्रं (yantra) including "any instrument for holding, restraining, or fastening, a prop, support, barrier"; "any instrument or apparatus, mechanical contrivance, engine, machine, implement, appliance"; "restraint, force"; "an amulet, mystical diagram supposed to possess occult powers," see: Monier-Williams. A Sanskrit-English Dictionary. (Delhi: Motilal Banarsidass, 1899), 845. ↑ Roderick Bucknell, & Martin Stuart-Fox. The Twilight Language: Explorations in Buddhist Meditation and Symbolism. (London: Curzon Press, 1986), ix. ↑ mandala21century.org. Nepal Council for Preservation of Buddhist Religion. Retrieved October 4, 2008. ↑ Jytte Hansen, Albertslund, Denmark Mandala Retrieved October 4, 2008. ↑ Mandala by Jytte Hansen Retrieved October 4, 2008. ↑ BENOY K. BEHL, [http://www.hinduonnet.com/fline/fl2122/stories/20041105000106500.htm TRANS-HIMALAYAN MURALS ] Frontline 21 (22) (2004) online hinduonnet.com Retrieved October 4, 2008. ↑ The Mandala - Sacred Geometry and Art Article of the Month - September 2000  exoticindiaart.com Retrieved October 4, 2008. ↑ lotsawahouse.org. Retrieved October 4, 2008. ↑ hinduonnet.com. Retrieved October 4, 2008. ↑  angelfire.com Retrieved October 4, 2008. ↑  Retrieved October 4, 2008. ↑ Hansen,  Retrieved October 4, 2008. ↑  asianart.com. Retrieved October 4, 2008. ↑ Sand Mandala Retrieved October 4, 2008. ↑ Melitta Tchaicovsky  Retrieved October 4, 2008. 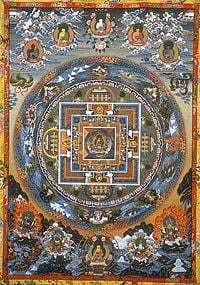 ↑ Alexander Berzin, December 2003 The Meaning and Use of a Mandala berzinarchives. Retrieved October 4, 2008. ↑ Julie O'Donnell, et al., A Monograph on a Vajrayogini Thanka Painting  Retrieved October 4, 2008. ↑ Of Charnel Grounds, Graveyards and Cremation Groundsthe yoniverse. Retrieved October 4, 2008. ↑ Venerable Thubten Chodron, Preliminary Practice (Ngondro) thubtenchodron.org. Retrieved October 4, 2008. ↑ It is correctly termed a "dromenon," not a maze nor labyrinth, because there is only one path to the centre. ↑ R.H. Matthews, "The Burbung of the Darkinung Tribes, 1897, online  Proceedings of the Royal Society of Victoria 10, 1: 1-12. newcastle.edu.au. Retrieved October 4, 2008. ↑ Mandalas: Sacred Art and Geometry religionfacts.com. Retrieved October 4, 2008. Brauen, M. The Mandala, Sacred circle in Tibetan Buddhism. London: Serindia Press, 1997. Cammann, S. "Suggested Origin of the Tibetan Mandala Paintings." The Art Quarterly 8 (1950) Detroit. Chutintaranond, Sunait, "Mandala, segmentary state, and Politics of Centralization in Medieval Ayudhya," Journal of the Siam Society 78 (1) (1990): 1. Grossman, Sylvie and Jean-Pierre Barou. 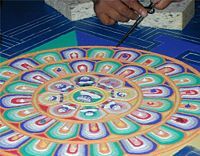 Tibetan Mandala, Art & Practice. The Wheel of Time, Konecky and Konecky, 1995. Lieberman, Victor Strange Parallels: Southeast Asia in Global Context, c. 800-1830, Volume 1: Integration on the Mainland. Cambridge University Press, 2003. Monier-Williams, Monier. A Sanskrit-English Dictionary. Delhi: Motilal Banarsidass, 1899. Stuart-Fox, Martin. The Lao Kingdom of Lan Xang: Rise and Decline. White Lotus, 1998. Tambiah, World Conqueror and World Renouncer, Cambridge, 1976. Tucci,Giuseppe. The Theory and Practice of the Mandala, trans. Alan Houghton Brodrick. New York: Samuel Weisner, 1973. Vitali, Roberto. Early Temples of Central Tibet. London: Serindia Publications, 1990. Wayman, Alex. "Symbolism of the Mandala Palace" in The Buddhist Tantras. Delhi: Motilal Banarsidass, 1973. Wolters, O.W. History, Culture and Region in Southeast Asian Perspectives. Institute of Southeast Asian Studies, Revised Edition, 1999. This page was last modified on 4 October 2008, at 18:55.